As summer ends, and the fall begins, it turns out that the best place to watch (Nissan) Leafs is the left coast. Like foliage, the Leafs are in clusters. As fall approaches Leaf peeping is again on our minds. The Nissan Leaf is one of the best-selling electric vehicles in the Unites States, neck and neck each month with the Chevy Volt. But where are all the Nissan Leafs? Here on the right coast they are as rare as baby pigeons. One can drive for weeks without spotting one. It turns out they are clustered in a few key markets. Here is the breakdown courtesy of Nissan. 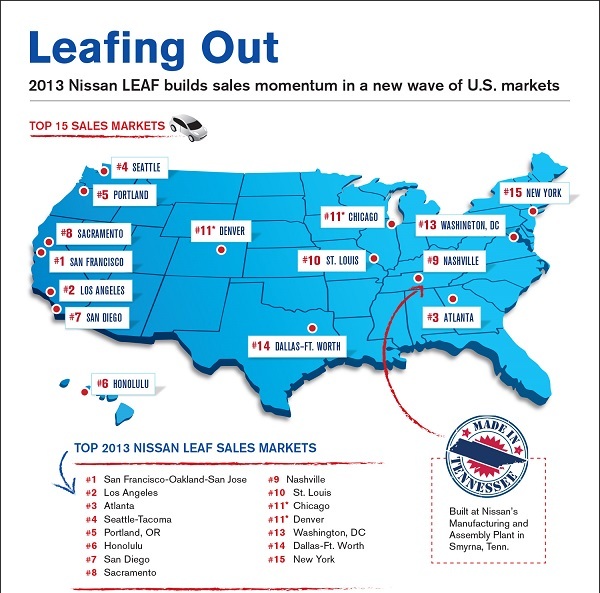 Number One Leaf Market – San Francisco, CA - There is no better US market for the Nissan Leaf than San Francisco. Here, the diminutive green machine can break into the top ten selling vehicles. Number Two Nissan Leaf Market – Los Angeles, CA – Nissan credits dense urban driving as a boon to Leaf sales in LA. Erik Gottfried, Nissan director of EV Sales and Marketing “LEAF really whips gasoline-powered vehicles in traffic jams and congestion because unlike them, it uses minimal energy while sitting in traffic.” That might be, but the other green cars like the Toyota Prius offer a similar cost to drive in stop and go city traffic, which might be why the Prius outsells the Leaf by a better than 10 to one ratio. Number 4 Nissan Leaf Market – Seattle, WA – In Washington the power companies advertise and promote EVs, which helps the Leaf. Number 5 Nissan Leaf Market – Portland, OR – Like, Washington, Oregon’s tax payers actually employ a “Chief EV officer” to promote electric cars. Number 3 Nissan Leaf Market – Atlanta, GA – The Leaf does have a toe hold in one East Coast city and that is Hot-lanta. The reasons why the Leaf might be doing well here are explained by Brendan Jones, director of EV Infrastructure Strategy for Nissan. In an announcement she said that the $5,000 credit given to buyers of EVs by the state of Georgia’s taxpayers, and the fact that EVs are allowed in the high occupancy toll lanes (HOT) makes the Leaf an attractive green-car choice. Electric vehicles are now selling in about the range that extremely low volume gasoline cars, like the Scion Tc and other niche cars you never hear about, see, or read news reports about. The mainstream and automotive-focused media is keeping the EVs front and center in the news and that, plus promotion by states and cash incentives seem to be helping lift the greenest of green cars up a bit from their previous extremely low sales numbers.